A vast plateau full of pine trees that get incredible golden glow in the sun’s rays makes Zlatibor one of the most beautiful mountains in Serbia. Serbian capital of mountain tourism, buzzing with tourists during the summer and during the winter alike, is located at an average elevation of 1,000m, and is surrounded by peaks Tornik (1.496m), Čigota (1.422m) and a number of lower ones. This mountain of great beauty is full of spacious clearings crisscrossed with mountain streams, which attract tourists from all over the world. Because of its distinctive climate and air currents that can only be found here, harmonious relationship between forested areas of pine, fir, spruce and vast meadows covered with colorful plants, clean air, clear water, a large number of sunny days, beautiful ski runs, Zlatibor has developed into a famous mountain tourist resort with the longest tradition in Serbia. 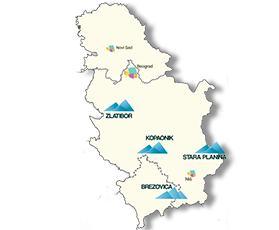 Tornik ski resort is located at an elevation of between 1,110 – 1,490m, 9 km from the tourist resort of Zlatibor. The total capacity of the ski area is about 5,400 skiers per hour. Tornik ski resort is equipped with a six seater chairlift, with the capacity of 3,000 skiers per hour, two T-bar ski lifts with total capacity of 2,400 skiers per hour. Four runs, Cigota, Tornik, Ribnica and Zmajevac are covered by an artificial snowing system, so this ski resort no longer depends on weather conditions. The ski resort Tornik has a special type of installation, the so called tubing, which, as the chairlift itself, can be used during both summer and winter periods, and provides immense pleasure and excitement to all who decide to try it. The ski resort is equipped with a children's playground and a carousel. The ski resort Tornik has its own parking place.